Blog to End the Occupation: Do you know Sekou? Learn from Resistance Leaders from Ferguson to Palestine! This month marks one year that the black youth of Ferguson have maintained what some are calling the second longest protest in U.S. history -- after the Montgomery Bus Boycott. For more than 365 days, the world has watched and learned from extraordinary black resistance leaders who, like the people of Palestine, will not be silent in the face of state violence and oppression. Rev. 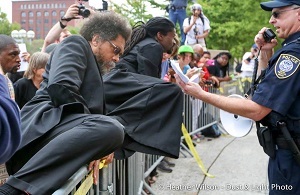 Sekou & Dr. Cornel West storm police barricades. Photo by Heather Wilson. One of those leaders has been Reverend Osagyefo Sekou, a St. Louis native from member organization Fellowship of Reconciliation, who has mentored, challenged, entertained, and led the way for many of us in Ferguson and St. Louis since the beginning. 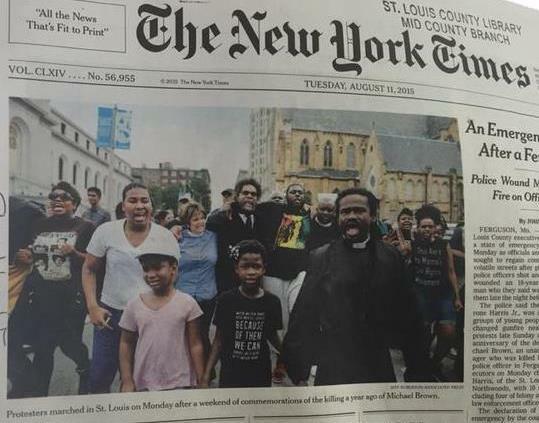 Many of you may have seen him on the cover of The New York Times last week after he was arrested with more than 50 others in a creative, nonviolent, clergy-led direct action as part of the one-year commemoration of the killing of Mike Brown. The night before he was arrested, Sekou spoke to a cheering crowd of hundreds in Ferguson about the injustices of the Israeli occupation of Palestine, welcoming the father of a Palestinian martyr to take the stage with him. Today, I am thrilled to announce that Rev. Sekou will be a keynote speaker at our upcoming National Conference in Atlanta September 25-27 -- just 5 weeks away! Discounted registration ENDS THIS FRIDAY. Have you registered yet? One of the most dynamic speakers I have ever seen, Rev. Sekou will be joined by countless other extraordinary voices including Palestinian poet Remi Kanazi, Dream Defenders co-founder Ahmad Abuznaid,#BlackLivesMatter co-founder Patrisse Cullors, Palestinian Youth Movement organizer Loubna Qutami, Ruby Sales of the Student Nonviolent Coordinating Committee (1963-1966), Baltimore resistance leader and Palestinian rights advocate Rev. Dr. Heber Brown III, and many, many others. ... Because 2015 marks 10 years since the BDS call and more than 100 U.S. victories, transforming us from a marginal movement to a force to be reckoned with by Congress and presidential candidates! ... Because never before have the connections and solidarity between people of color here and in Palestine struggling for freedom manifested so visibly and powerfully as in the last year. ... Because what better way to spend a weekend than meeting amazing activists and learning from each other? Meet me in Atlanta. Register before Friday when rates go up! Don’t keep putting it off. You won’t regret it! We will share our wisdom and learn from generations of leaders about how to build a mass movement supporting for justice for all and resistance to racism from Baltimore to Susiya, from Alabama to Palestine and beyond. One more thing -- if you can’t make it but support the conference, please make a contribution so somebody else can. You can help us make sure that anybody who wants to be at this momentous event has the chance, regardless of their financial situation.